The Little Stranger – Film Review by Frank L.
Following his Oscar nomination for Room (2015), Abrahamson returns with this adaptation of the post war novel by Sarah Waters, written in 2006. Although it is set in a rambling mansion called Hundreds Hall, its owners, the remnants of the Ayres family, are eking out an exceedingly pinched existence in the ever deteriorating edifice. The family consists of the aloof and emotionally strained Mrs. Ayres (Charlotte Rampling), her seriously war-wounded son Roderick (Will Poulter) and her brusque, no-nonsense daughter Caroline (Ruth Wilson). The household is completed by a single maid Betty (Liv Hill). 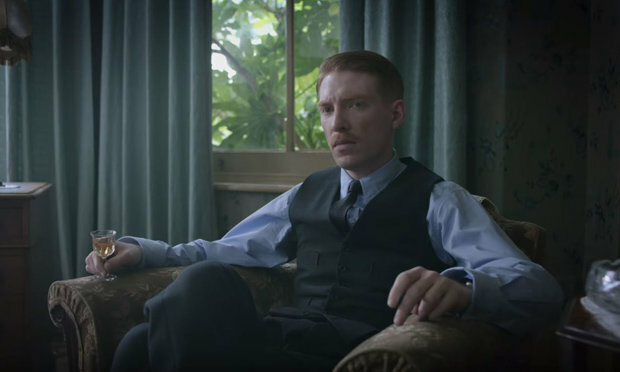 Roderick’s illness requires Faraday (Domhnall Gleeson), a young doctor who has recently joined the local general practice, to visit them. He knows Hundreds from his childhood as his mother worked there as a maid. At one level this is a study of the altering gradations of class in rural England following the end of the second world war. However, the mansion has its own story to tell as its inexorable decline continues. It permits inexplicable things to happen within its walls such as servant bells ringing without cause and mysterious writing appearing on its walls. It unnerves its occupants who have more traditional worries such as little or no cash. Faraday, notwithstanding his inferior social origins gains the respect of all three of the Ayres to varying degrees. His acceptability is underlined by his being invited as a guest to a little dinner party which Mrs. Ayres organises for some suitable neighbours. Faraday, as he pursues his medical career, has travelled far socially, so much so that he and Caroline even strike up a friendship of intimacy. But this is a family damaged in more ways than one as the tense musical score by Stephen Rennicks indicates. Hundreds and its past encircles them in different ways and makes each of them uncertain. The house as a location itself is perfect with its faded facade, grand hall, stately and well proportioned reception rooms, coupled with the below-stairs, Dickensian grimness. The atmosphere within the house adds to the sense of increasing uncertainty as erratic events continue to happen. Abrahamson keeps a fine balance between the diminishing social rituals of a Big House and the increasingly perturbed existences of its household with Faraday initially as an outsider providing a counterpoint. Rampling, Wilson and Gleeson are each entirely convincing in their parts and together as an ensemble they create an atmosphere which suits the story well. The roles of Roderick and the maid Betty are subsidiary but they are realised with assurance and add substantially to the class gradations which underlie the tale. It is a world confidently created by Abrahmson but nowadays difficult to imagine that it existed so recently. It is a complex film and definitely an enigma when it comes to classification. That is not a defect. It should be savoured for what it is namely a well-made film which engages on many levels.